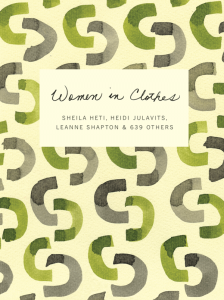 Women in Clothes , by Sheila Heti, Heidi Julavits, and Leanne Shapton, is a literary art gallery. The book itself could be the centerpiece of a living room’s décor, nestled amidst eclectic art pieces complimenting the cover design. My first thought when picking up Women in Clothes was how great it will look on my coffee table. But as I began to explore its contents, I discovered the depth and breadth of the artistic genius goes beyond its visual appearance, with imaginative, surprising and thought provoking craftsmanship with each turn of the page. The Introduction presents a real-time conversation between the main three authors as they explore the idea of writing a book on what women think about as they shop and dress. Author Sheila Heti searched for a book on this topic, discovered it did not yet exist and reached out to her friends, Heide Julavits and Leanne Shapton for their input. Actual skype and email conversations between the authors make up the Introduction, which takes you on the step-by-step journey into how they pulled together this 515 page anthology. As you read Women in Clothes, you walk through an art gallery. The dynamic techniques used in compiling it range from real-time conversations, answers to survey questions, and full page essays addressing fascinating topics, such as the story of Sadie Stein’s three magical dresses. Photo galleries of collections from many of the book’s 642 contributors intersperse between clothing prose. There are picture assortments of Joyce Wall’s lipstick blots, Annie McDonald’s clogs, Lydia Burkhalter’s grey sweatshirt collection and even a page with Jemima Truman’s spare buttons, photographed individually, as a few examples of the many visual compilations which make this book unique. A world of new friends and ideas opens as you read Women in Clothes. It’s like attending a belletristic slumber party surrounded by fun-loving girls generously sharing all their secrets to life, previously hidden in the clothing they’ve worn. One contributor, Petra Kruijt, describes how she draped herself in a soft, deep green cashmere scarf, which enveloped her like a blanket, and had the colleague she despised most pay her a great compliment. It was then that Petra realized if she loves what she’s wearing, others will notice. Among the varied sections throughout Women in Clothes, I loved the “Mothers as Others” project most. It has a Part I and Part II featured later in the book; the participants were instructed to, “Send a photograph of your mother from the time before she had children and tell us what you see.” I found joy gazing at all of the pictures and discovering the meaning each photograph held for their daughters. Even though I don’t know any of the mothers, the images enthralled me and sparked my imagination. I could read an entire book just on this “Mothers as Others” project alone. If you seeking a delightful escape into imagination, art and fashion, this is a must-read. If you are a woman looking for a light-hearted resource to understand yourself better, this is also the book for you. Thank you, Melanie! Love this book as way to explore what living true means to oneself through the world of clothes!